With the Army’s expanding role in Europe, Michael Formica of IMCOM Europe voiced a clear message to garrison employees: We need to invest in our garrison employees. Photo by Andreas Kreuzer. GRAFENWOEHR, Germany — Describing the role of U.S. Army Garrison Bavaria within the framework of today’s international geopolitics and uncertain future, the director of Installation Management Command in Europe highlighted expanded training opportunities for U.S. and local national employees at a town hall here Feb. 18. 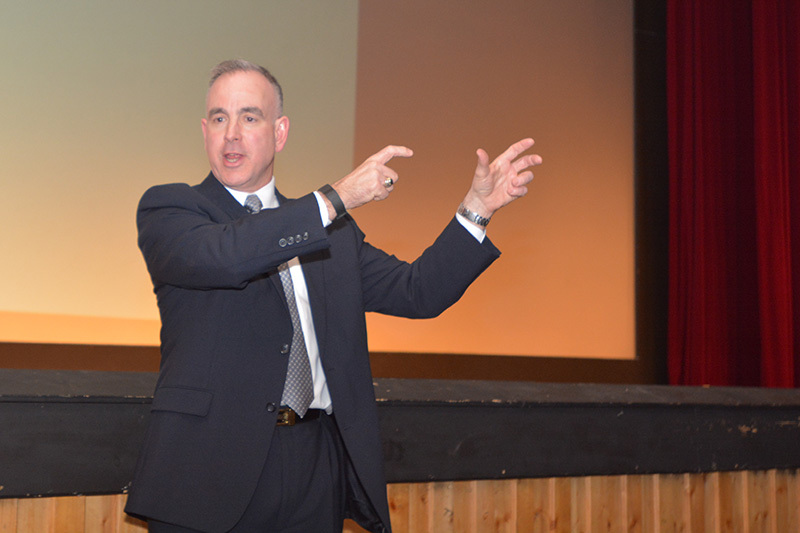 With the Army’s expanding role in Europe, Michael Formica of IMCOM Europe voiced a clear message to garrison employees: We need to invest in our garrison employees. In today’s environment, Formica said, our Army and NATO play a role in deterring Russia and terrorist activity — from the eastern flank of Europe and along its southern flank. “We can’t do that without you,” said Formica to a theater packed with garrison employees. The IMCOM region director described the Army profession — codified in 2010 and updated in 2015 — and tied it to the responsibility of all Soldiers and civilians of all paygrades and nationalities. The profession is about character, competence and stewardship, he said. “I want you to consider yourself as not a worker or an employee, but as a member of the United States Army, as a professional,” Formica said. But every professional needs training and education in addition to experience. Formica has approached Army leadership, for example, to “open the doors” to allow greater participation by more German, Belgian, Dutch and Italian local national employees.